Over the last decade I have had countless requests for a thin pickup that will mount onto an acoustic archtop that requires no modifications to the guitar. As you may be aware the space between the strings and the top of the guitar is often very small so it requires a very short or thin pickup to fit. Most pickup designs are too tall to fit on an archtop. We have a specialized mini humbucker patterned off the old Gibson Johnny Smith pickup. The Johnny Smith is ½” tall which is shorter than a typical mini and it requires that the guitar is either set up for a neck mounted bracket (the guitar has to be made specially for this) or we have another version that mounts to the pickguard- however it’s still a little too tall to fit on a lot of archtops. A couple years ago I had an archtop builder ask for me to make a McCarty pickup. The McCarty pickup was a product Gibson introduced in 1948 which could be mounted as an aftermarket piece of hardware to any Gibson archtop (and many other makes) and they also came mounted for a period of time as a standard item on Gibson L-7’s. The unique feature of this pickup was that it came built into a pickguard along with a volume, tone and output jack. You could screw on the new pickguard to the pre- existing location and it converted your acoustic archtop to a fully functioning electric guitar. The pickup/pickguard assembly came in single and double pickup models and it had a separate design for cutaway and non cutaway guitars. About maybe a year ago I got ahold of Joe Vinikow at archtop.com. Joe is very informed on all aspects of archtop guitars and he was gracious enough to loan me an original non- cutaway McCarty pickup. It took me several months to find enough time to figure out how to reproduce the pickup. I had to have magnets custom made and go through the typical procedure of reproducing something from scratch. Once I had it made up and I started telling people on my waiting list, I had someone from England request a cutaway version. He sent me a tracing of the pickguard to copy and now I have two versions. Joe gave me a source for the miniature pots I needed- they are a high quality pot with a very smooth action. This McCarty style pickup & pickguard is a pre-wired assembly that can be installed into many archtop guitars. Overall thickness of the pickup is .45 inches, it comes with a volume and tone control built into the pickguard and there is a Switchcraft output jack attached to the guard too. The pickguard does not come drilled for the screw that holds the pickguard to the face of the guitar and it does not come drilled for the angle bracket to screw the guard to the side of the guitar. These holes need to be drilled by the end user so they will match whatever pickguard you already have installed. At this point I only make the single pickup model in cutaway or non cutaway configurations. I also make a version to fit the Godin 5th avenue non-cutaway. The Godin version is pre drilled for the attachment to the body (body and bracket screw hole locations). I am in the process of borrowing a 2 pickup version Joe recently found. I can make the pickguards in a variety of commonly available laminated material. 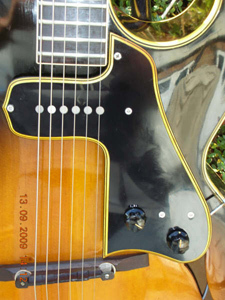 Pickguard materials include tortoise, black or pearloid. This entry was posted in Mccarty pickup, New Products and tagged archtop, archtops, gibson, Mccarty pickup, mini humbucker, pre-wired pickguards by admin. Bookmark the permalink.